DAMASCUS, Syria - Syrian President Bashar Assad made a rare visit to the front line of his country's civil war, spending New Year's Eve with his troops in a tense eastern Damascus neighborhood, state media said Thursday. 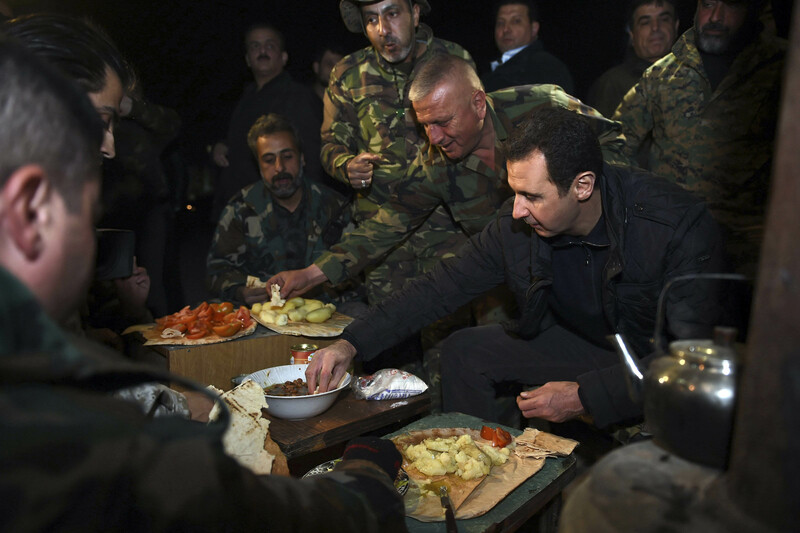 State TV footage showed Assad having dinner with soldiers and pro-government gunmen in the neighborhood of Jobar on Wednesday night. The neighborhood has witnessed intense fighting over the past months between troops and opposition fighters. "On New Year's Eve families gather but you decided to be here to protect your country," Assad told the troops as sporadic shooting could be heard. "I like to be with you on this occasion." Assad described rebels who use underground tunnels as "rats," adding that "we fight them above the ground." The footage, aired Thursday, showed Assad shaking hands and kissing troops, walking into fortifications and climbing onto a tank. Syrian troops have been fighting against rebels in Jobar since 2013 and state media says government forces have been advancing in the area. Assad rarely makes public appearances since the country's crisis began in 2011. The last time he visited the front line was on Aug. 1, 2013, when he went to the former opposition bastion of Daraya outside of Damascus. Syria's war, now well into its fourth year, began as an uprising against the Assad family's four-decade rule. It has since become a complicated civil war, and activists estimate some 200,000 people have been killed.